Although Maptime got its start in San Francisco, chapters have sprouted up all over the world, and now, in Sacramento. 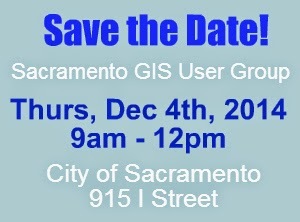 Come join us for Maptime Sacramento's inaugural hack night! Beginners, you are especially welcome. 7:00: "Anatomy of a Web Map" We'll learn about the different pieces of a web map and how they work together. This is going to be a hands-on tutorial, so please bring your laptop! Davis, Calif.— Take a winter course in Geographic Information Systems from UC Davis Extension. Visit our website for a full listing of courses and to learn about the Geographic Information Systems Professional Concentration. • Dec. 16-18: Tues.-Thurs., 8:30 a.m.-4:30 p.m.
• $725. Enroll in section 143NAT401. • Feb. 4-25: Wed., 6-9 p.m.
• UC Davis: Plant and Environmental Sciences, 387 North Quad. • $500. Enroll in section 143NAT431. • Feb. 20-21 and March 6: Fri., Sat., 8:30 a.m.-4:30 p.m.
• $650. Enroll in section 143NAT420. • March 24-25: Tues., Wed., 9 a.m.-4:30 p.m.
• $500. Enroll in section 143NAT423. UC Davis Extension, the continuing and professional education division of UC Davis, has been an internationally recognized leader in educational outreach for individuals, organizations and communities for more than 50 years. With 62,000 annual enrollments in classroom and online university-level courses, UC Davis Extension serves lifelong learners in the growing Sacramento region, all 50 states and more than 100 countries. We’re reaching out to you in the hopes that you will publish this information. If you do not wish to continue receiving periodic announcements from UC Davis Extension, simply send an email with the word "unsubscribe" in the subject line to info@ucde.ucdavis.edu and we will remove you from the list. Not produced at state expense. UC Davis Extension is a self-supporting, nonprofit organization funded solely by course fees, grants and contracts. 9:10 AM: Mark Dumford, Interwest, GIS Manager -- "Implementing ArcGIS Collector for Field Inspection"
9:40 AM: Ronnie Richards, Sacramento County, GIS Manager -- "Working From Anywhere Using ArcGIS Collector"
10:40 AM: Jane Schafer-Kramer, Research Analyst II (Geographic Information Systems), Department of Water Resources -- "GIS Jobs in California State Service"
11:10 AM: Jim Schmidt, GIS Analyst, Rim Fire Recover Project – “Rim Fire Lidar Overview. Davis, Calif.— Take a summer course in Geographic Information Systems from UC Davis Extension. Visit our website for a full listing of courses and to learn about the professional concentration in GIS. • June 18-20: Wed.-Fri., 8:30 a.m.-4:30 p.m.
• $650. Enroll in section 134NAT422. • June 25-27: Wed.-Fri., 9 a.m.-4:30 p.m.
• $650. Enroll in section 134NAT404. • Aug. 13-15: Wed.-Fri., 8:30 a.m.-4:30 p.m.
• UC Davis: Plant and Environmental Sciences, California Ave.
• $725. Enroll in section 141NAT401. UC Davis Extension, the continuing and professional education division of UC Davis, has been an internationally recognized leader in educational outreach for individuals, organizations and communities for more than 50 years. With more than 50,000 annual enrollments in classroom and online university-level courses, UC Davis Extension serves lifelong learners in the growing Sacramento region, all 50 states and more than 100 countries. 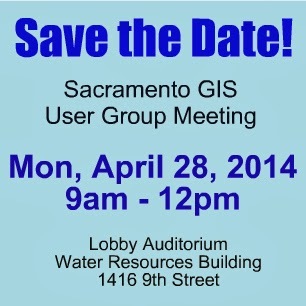 Save the Date - Next Meeting April 28, 2014! Davis, Calif.— Take a spring course in Geographic Information Systems (GIS) from UC Davis Extension. Visit our website for a full listing of courses and to learn about the professional concentration in GIS. • April 25: Fri., 8:30 a.m.-4:30 p.m.
• $380. Enroll in section 134NAT421.